I was demonstrating my work during my MODA exhibit in 2010, a man who owned an aviation company approached me and asked, "Have you ever thought about working in aviation? a week later I was at Duncan Aviation in Lincoln Nebraska getting a 3 day crash course in jet aircraft interiors. They were looking for a new way to create and apply jet aircraft interiors. Little did I know that my, soon to be, invention would lead me to uprooting myself and family, moving to Nebraska for a year, and working side-by-side with Duncan's engineers and designers to create a prototype that would pass the FAA's stringent 18G forward load case. This was the beginning of AIMS, short for Aircraft Interior Modular System. When I arrived in Lincoln I met many of the engineers and designers. They were enlightening me on the intricacies of what makes the most high-end furniture in the world work. It was not long until I realized that the panel pin in conventional jet aircraft interior construction had to be removed. This panel pin has created a back pressure in advancements in this field for several decades now. So I got to work on the solution. I created the AIMS A1 prototype. Obviously not meant for flight, but it proved the novel concepts were feasible. After representative in completions visit my studio in Atlanta to see the A1 prototype we found ourselves the verge of new possibilities. Weeks later, Driving a cargo van with the prototype in the back, I was headed for Lincoln Nebraska. I unloaded the prototype and presentation materials in hangar B. I gave my presentation to the engineers and designers of Duncan Aviation. A third of the engineers left shortly after the presentation, a third of the engineer scratched their heads and a third saw the possibilities and were immediately excited. A few months later Duncan Aviation had put together a business plan. They moved me and my family to Lincoln Nebraska so I can work side-by-side with the engineers in producing a prototype that could past the stringent 18G forward load case. After a few months we had designed the A2 prototype. Designed to fit in a phenom 300. 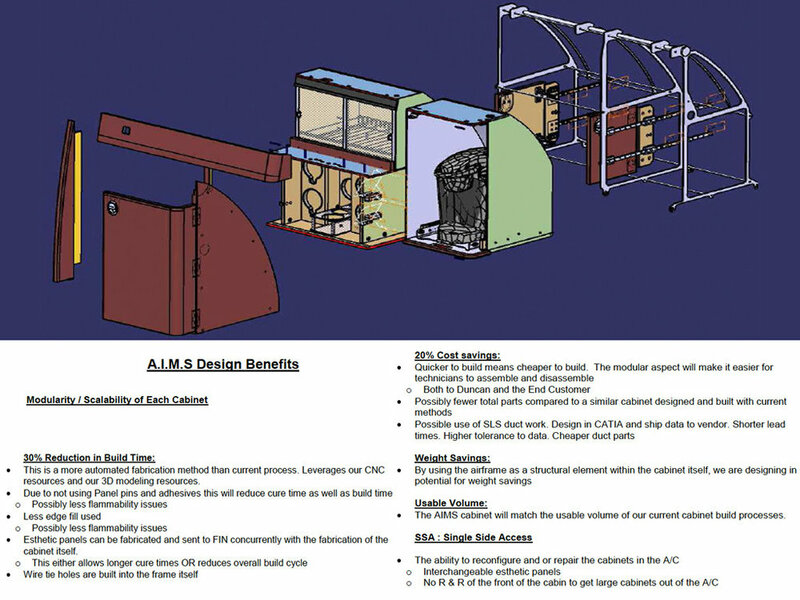 In finite element, It passed the 18G forward load case, had within it all of the modular benefits but, we made it look just like the spec galley in the presently in jet. Although it looked the same on the outside, ours can be taken out of the aircraft in less than an hour by only two technicians. It had the same usable space, the same weight but could be taken apart and reassembled an infinite number of times without any loss in structural integrity. 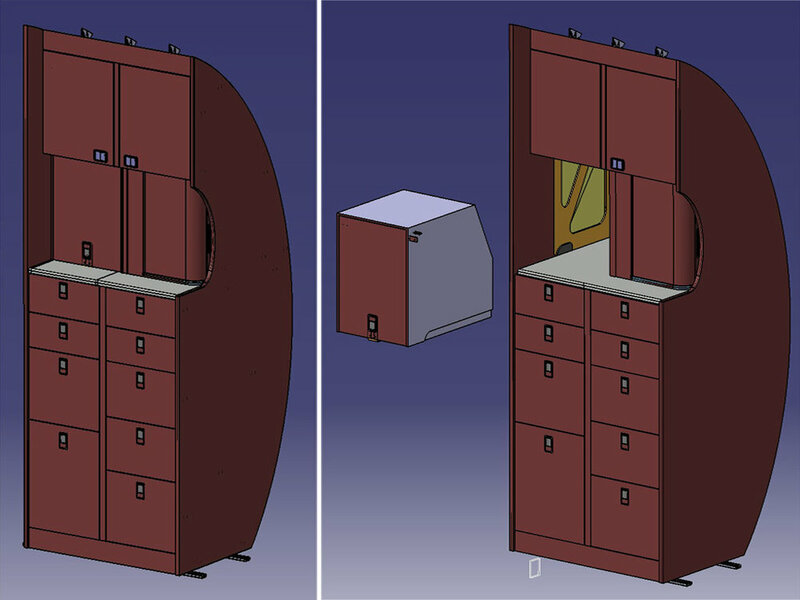 With the A2 prototype we were able to prove that we can produce such cabinet in 30% less production time and cost. We can prove that our construction method justice light if not later. We could prove it had just as much usable space if not more. Because of how our construction method supported wait we were able to dramatically change the STC process and furthermore we could elegantly direct load forces elegantly through the system like never seen before. Construction method like this would’ve never been possible without the advancements in CNC cutting technologies and parametric cad design. With all the excitement there was some loss in focus and crucial areas. We did not even know what the time something like this could be patented. Honestly, I believe the company did not think it was possible and they were not ready to except that this could work. As the interest grew, so to the demands of my time. My attorneys got involved and we were all questioning directions. Ultimately, I should’ve let business people do business and kept the legal team pushed to the side. The legal advice and red tape got so thick it was hard to move forward. Simultaneously, Duncan Aviation was experiencing some large setbacks that required their focused attention. Unrelated to my project, the had to move forward with many layoffs. This left me, my team and this new technology treading water. The engineers that I worked closely with at Duncan Aviation believed in the technology we absorb them into our own team and move forward with another prototype for a challenger jet. Then, move forward to produce several more. Each time proving aspects of the AIMS system were not only feasible but far more efficient than conventional methods of jet aircraft interiors today. After half million dollars and all the time spent, all the executive meetings and midnight oil could this even be patented? It weighed heavy on our minds for years. So much invested without being able to patent it would seem like our efforts were all in vain. Then that day came. We had an official patent granted by the USPTO and now here we are. We are looking for the right company. We are looking for a company with an R&D facility and forward way of thinking. We are taking our method up against the status quo and conventional methods. We are looking for a company who can work with us and get this in the sky. We are holding the patent and it’s continuances. We have a small and forward thinking team that can work with your engineers. Once your engineers understand our system it will not be difficult for them to apply this in any area of the aircraft. We have companies like NetJets who are very interested in the system but as you know they don’t build anything. We’ve had conversations with them over the years and they are waiting for us to get back to them.This is the ideal interior system for fractional reserve fleets. Reach out to us, This is a paradigm shift in jet aircraft interiors.